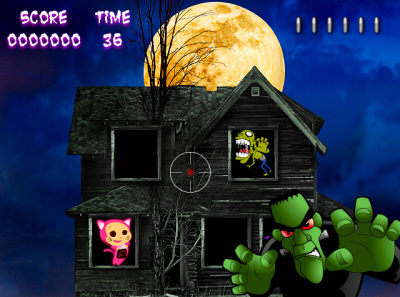 Description Haunted House Shooter is a simple point and click shooter themed for Halloween. Shoot the baddies but avoid shooting the trick or treaters. Shoot the bonus spider for extra time! Move the mouse and click the left the left button to shoot. Don't shoot the trick or treaters, shoot everything else. Shoot the bonus spider for extra time!